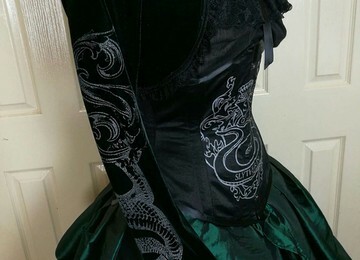 Check out our new Victorian Corset & Gown inspired by the slithery ones! Our head designer might as well be living at Hogwarts, it's become an obsession...hence this design..plus we all love emerald green. 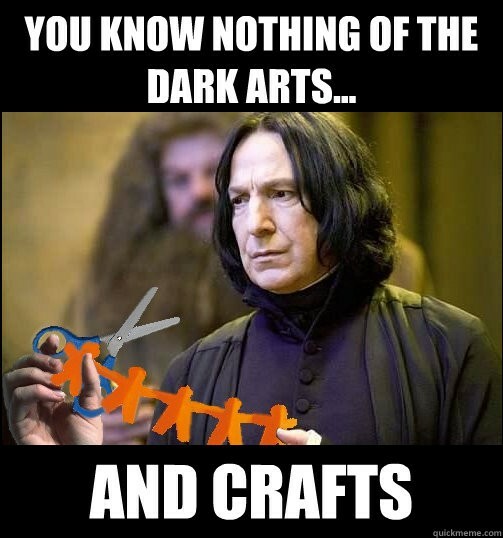 If you don't know what I'm talking about then you are obviously not part of the fandom that surrounds all things Slytherin. This is our new design with a corseted victorian edge and some beautiful, unique hand screen printing. This corset or full corset gown is now on the website and ready to be lovingly made to measure for you. We trust you will love and wear this to live out your Slytherin other self! 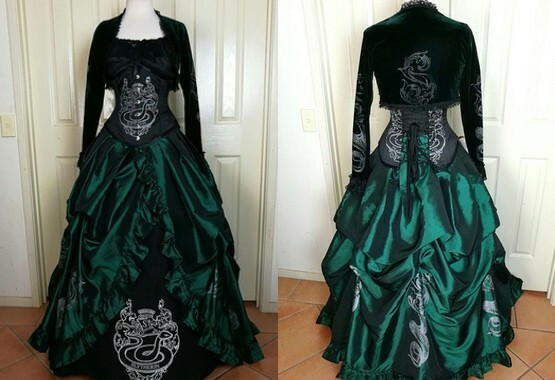 Ironfest comes first, then Supanova, then Winter Magic, then Teslafest and that's just events in NSW where this beautiful gown would be an outstanding cosplay costume. In Melbourne there's the Gothic Picnic, in the USA there's Dragoncon, in the U.K. there's Whitby and probably so many festivals and events we don't even know about. Inspired by the House of Slytherin is this dark green stretch velvet Bolero Shrug hand screen printed on the sleeves. 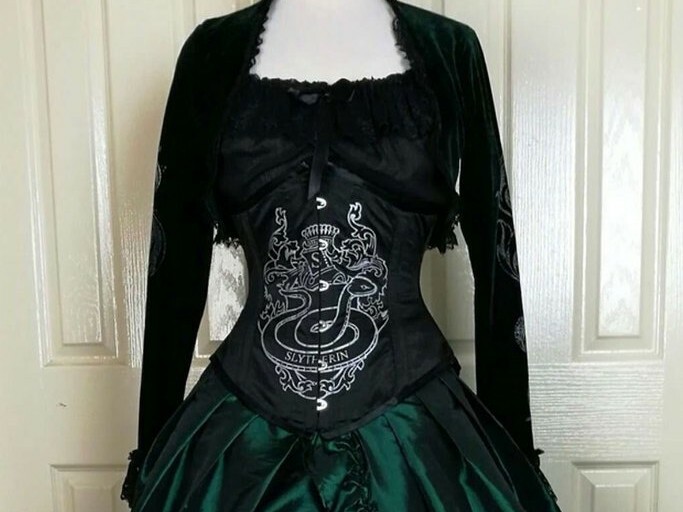 Beautiful black & silver corset made for you in Australia, guaranteed to give you an amazing waistline and silhouette for your Slytherin cosplay. 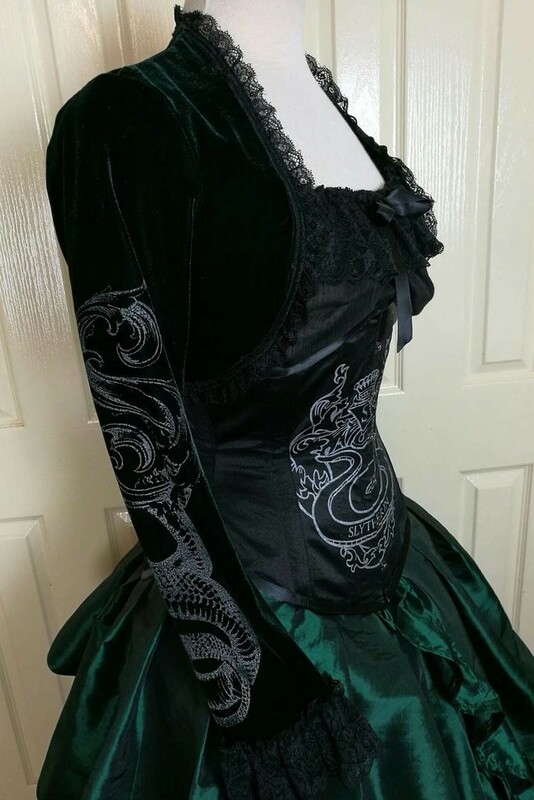 from the 4th April to the 13th April Corset Club members are getting a secret discount on online orders of this new corset design AND the 6 piece corset gown if they want to go full Slytherin? When you join the Corset Club we send you out special offers no one else receives - we really want to get you waisted! Oh..and if you are new to our Australian made, steel boned corsetry that will last for years and years and years...the standard corset sizing in this under bust design goes from size 8/20"corset waist to size 22/42" corset waist. Plus there's also custom sizing if you prefer or need it. This corset is guaranteed to cinch you in beautifully to give you a waist & posture like you've never had before. If you've been wanting a proper corset to cinch in your waist and accentuate your curves then take advantage of our Corset Season Offers for subscribers. Gallery Serpentine's specialist corset makers make strong, lifetime lasting steel boned corsets right here in Australia. We also sell quality European designed steel boned corsets. Over Corset Season we're sending out discounted offers on a variety of our corsets.